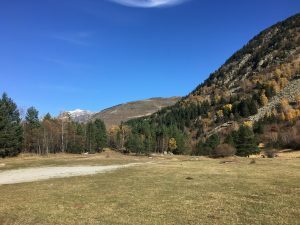 If you travel anti-clockwise from Rialp around the Aigüestortes I Estany de Sant Maurici national park, you eventually end up in the Vall d’Aran. 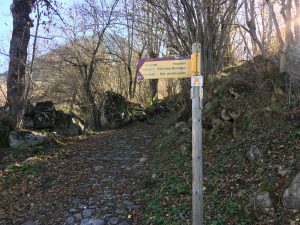 It’s a drive I would highly recommend, following the highly scenic river valley of the Noguera Palleresa northwards before turning away to the west. 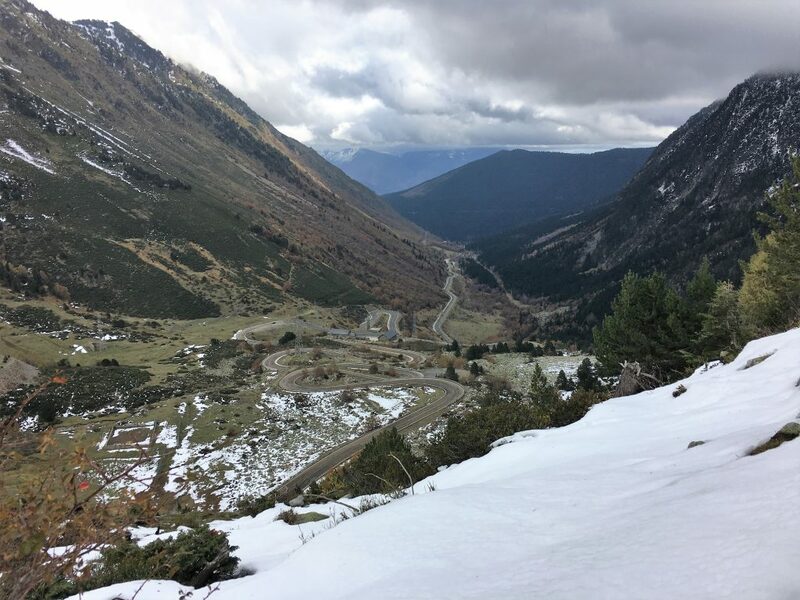 Only a short stretch is single track as it skirts around the cliffs just south of the village of Sorpe, the rest is a nice wide road and it’s only when it starts to make squiggly switchbacks just below the ski area of Baqueira-Beret that it really starts to gain height. The parking at the ski area was our first destination, the starting point for a walk into the Gerber valley. There was already snow on the ground here and so we strapped our snowshoes onto our rucksacks. We wanted to test them out on a walking route rather than a designated snowshoe route to see if they allowed us to extend out walk further, after all that’s the reason we had bought them. We weren’t the only people parked up here, the ski lifts were being tested so a couple of workers vans were in the car park and two people were already making their way up the ski slopes on their touring skis. Our route was not going up the ski slopes, but heading southeast from the bottom of the ski lift, following green signs along the side of the hill above the switchbacks we had just driven. 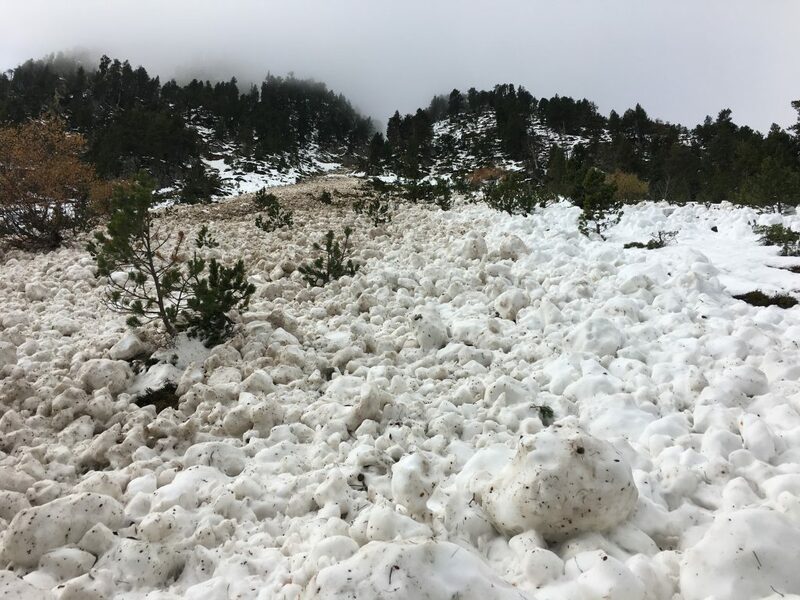 Our first hurdle was a series of avalanches. The snow of a few days ago had been warmed and melted by the sun and had sloughed off of the ground underneath leaving long bare stretches of grass and blocks of snow fanning out across the path. 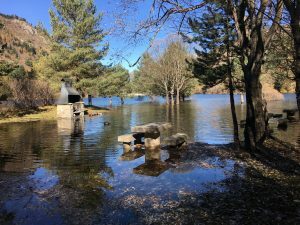 We had to pick our way around the debris and find the path again on the other side, a careful and painstaking exercise on what would normally be an easy path. Once past this section we ventured into the Gerber valley itself. The snow was getting thicker but the path between the trees was quite rocky. We weren’t really sure whether to put the snowshoes on and decided to leave it as long as possible. One thing that we now know about snowshoes is that they don’t allow you to magically float over the top of the snow – you still sink, just not quite as far and not as quickly. This means that walking in snowshoes has less impact on your joints than the repeated painful moments when walking in boots and the snow isn’t as firm as you thought. But it also means that you can snag on rocks and shrubs under the snow if it’s not deep enough. 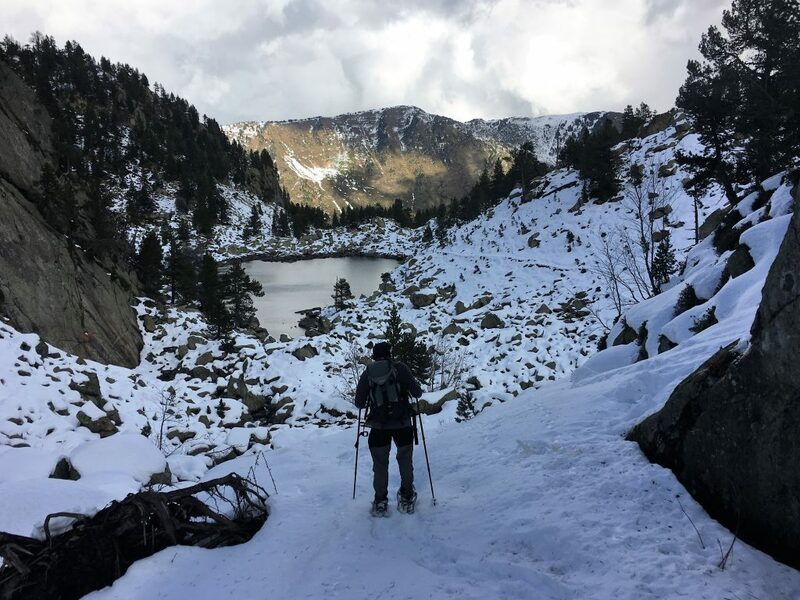 We finally decided the snowshoes had to go on when we started to hit knee deep snow while picking our way amongst snow, rock and streams around the Estanyera del Mig. 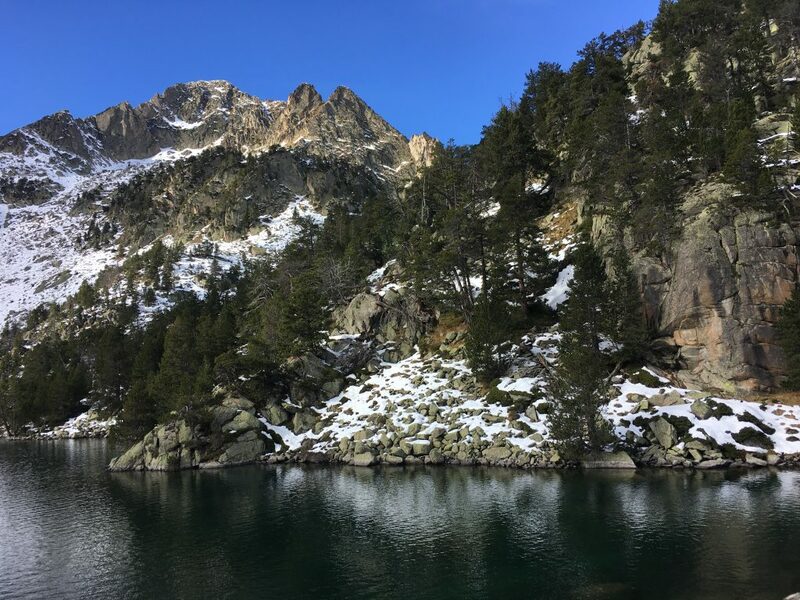 With a sign of relief we walked onwards up to the Estany Gerber, a large lake set amongst the peaks. To the south we could just make out the tops of El Encantats. We ate our lunch here, watching a squirrel jumping between the trees, and decided that we would turn around despite only having come 4.5km. Our avalanche avoidance had worn us out and we’d taken nearly three hours getting this far. We retraced our steps, keeping our snowshoes on until we started to see bare earth between the rocks and snow. Walking rocky paths in snowshoes does have it’s tricky moments, and I can see why the more heavy duty mountaineering snowshoes have a narrower design to avoid getting them trapped between rocks. Back at Bertie we decided that it was too cold to stay overnight at our parking spot, so (after a cuppa of course) we drove down into the Aran Valley to the village of Salardu where there was designated motorhome parking. 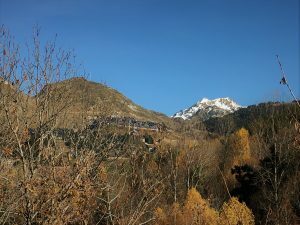 Our route took us through the massive ski area which is the largest in Spain and often hosts the Spanish royal family on their skiing holidays. There is a lot of new but ‘tasteful’ development here. Not so many large scale hotels, but lots of homogenous smaller apartment blocks in grey stone to blend with the traditional construction of the villages. 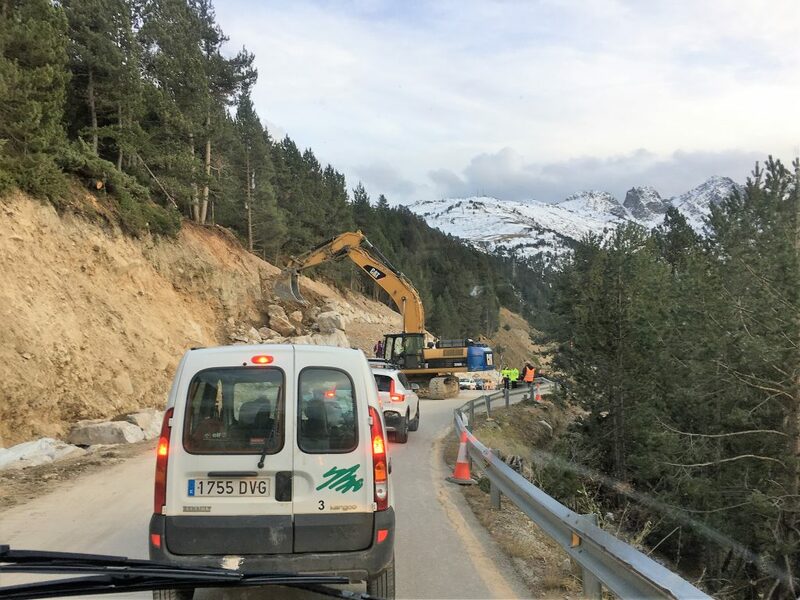 On the switchbacks down into the lower reaches of the valley there was construction work taking place, keeping us waiting for about twenty minutes as they manoeuvred huge stone blocks into place in an incredibly large scale version of dry stone walling. 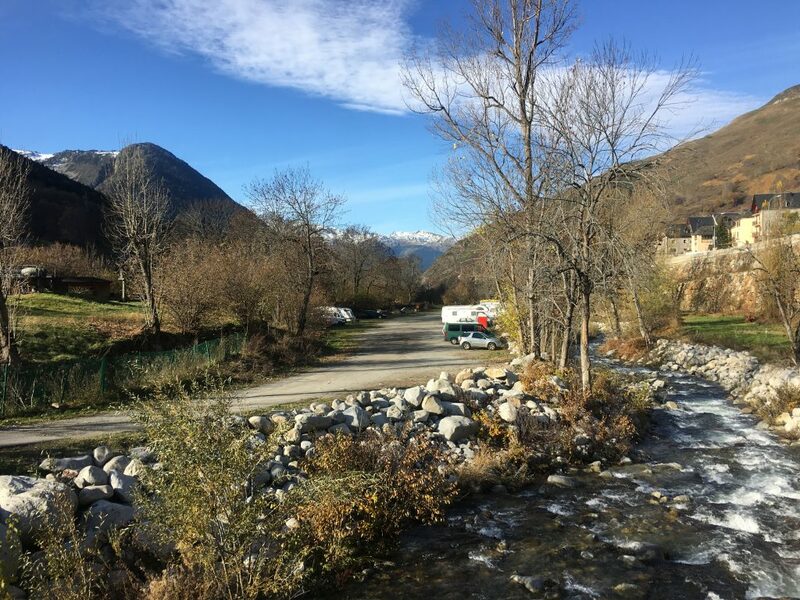 Down in Salardu the motorhome parking was in a rough gravelled area next to the river with good views of the mountains. A bit of undeveloped ground that was being put to good use from our perspective. A number of vans were obviously there on a long term basis, being used by workers or just parked up by locals. 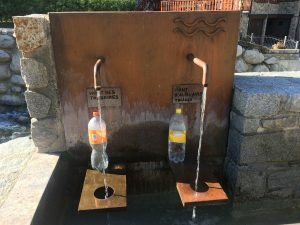 There were no services but it was flat and there were water fountains in the village where we could fill up our bottles. We took a walk up to the car park where there was a tourist office, unmanned but with a touchscreen information point and several maps. When we saw the number of BTT (mountain biking) trails in the area we felt very frustrated. We cant wait to get Paul’s bike back up and running. We also tried to find a shop that was open to pick up some bread, but there were no shops open at this time of year, just a couple of cafes. The following morning we set out for a gentle stroll in the Aran valley. We followed the sign posts around the valley. 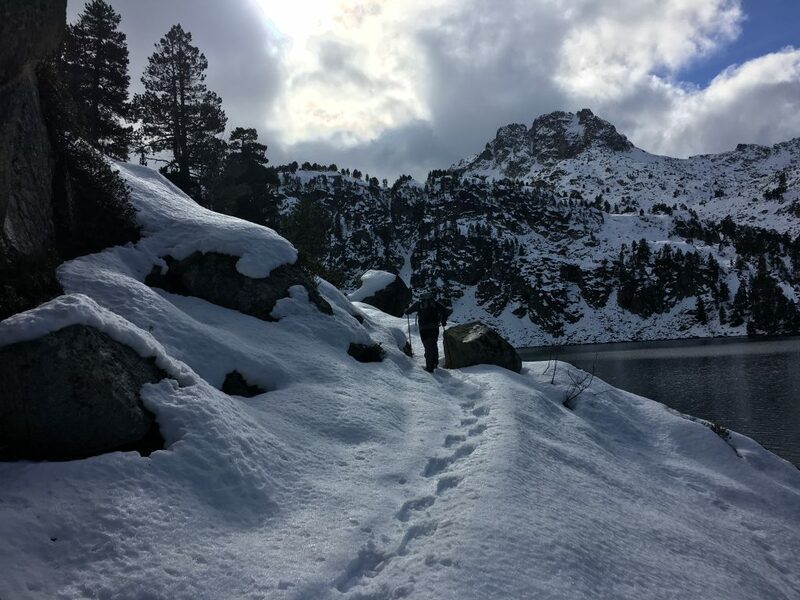 Heading south to the reservoir Aiguamog and it’s picnic area, then up to Baqueira village with it’s identikit ski accommodation and gondola station. Next stop was the village of Tredós and then finally back to Salardu. This was all on country lanes, some on tarmac, some rocks and cobbles and some dirt tracks but very easy going and a pleasant alternative to mountain walking. Our legs thanked us for the rest and we enjoyed soaking up the sunshine, watching fish in the river and horses and cattle in the fields. That night we stayed in Salardu again, it was a quiet and comfortable area. We’ve got some unfinished business here and I’m sure we’ll find ourselves mountain biking in the valley sometime in the next few years.